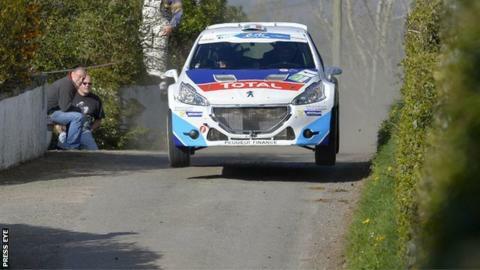 Top Irish driver Craig Breen is second after the first day of the Circuit of Ireland, which took in 10 stages. The Waterford man lies 12.6 seconds behind Finnish Skoda Fabia driver Esapekka Lappi, with another Irish competitor Robert Barrable in third. Breen, 24, won the final stage of the day in his Peugeot 208T16. German Sepp Wiegand is fourth going into the second and final day of action, while Ireland's Sam Moffett occupies a creditable sixth position. Breen, Ireland's top international rally driver, has two world titles to his name in the World Rally Championship's support classes. He also scored a notable victory on the Acropolis Rally in Greece last month, his first at European level. Breen currently heads the European standings following his heroics in Greece. The Circuit of Ireland is back on the calendar after a one-year absence and is round four of the European Rally championship. 37 crews entered for the International section, with 84 crews forming the National entry list. A total of 14 nations are represented.